Expression in the Netherlands is mostly equivalent with the Amsterdam School. Even though elements of Expressionism had entered religious architecture several years before that movement came along, they were fairly marginal at first. Eventually the architecture of most religious denominations would be more or less influenced by Expressionism, despite the fact that the architects of the Amsterdam School in many cases were socialists, or non-religious at least. 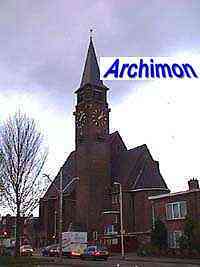 There were however big differences in styles between the various denominations, the Gereformeerden surprisingly building the most unconventional churches. The Amsterdam School definitely had the most impact on the protestant denomination of the Gereformeerden. Architects like E. Reitsma and B.T. Boeyinga designed some highly original churches, while Tj. Kuipers chose a more moderate form of Expressionism for his later work. Shown in the picture is Boeyinga's Koningkerk in Haarlem from 1926 (destroyed by fire in 2003), a two-storey church with three fan-wise arranged 'naves'. Extravagant though this church may look, some of E. Reitsma's churches were even more extreme, especially his churches in Andijk (NH) and Weesp (NH). The Expressionism of the Amsterdam School wasn't particularly popular in the Roman Catholic church. One of only a few Roman Catholic architects whose style was strongly influenced by the Amsterdam School, albeit only temporarily, was H.W. Valk, who built several churches and chapels in a clearly related style. 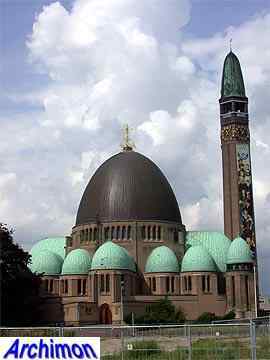 His big dome-church in Waalwijk (NB), the St. Jan, is the most important example. Later this architect moved towards a much more traditionalist direction. Of much more importance to catholic architecture than the Amsterdam School was a style developed by French monk and architect Dom Bellot, who had an architecture office in a monastery in Oosterhout for several years. His style would become of influence internationally for several decades, especially in Canada. In the Netherlands he influenced several much more famous architects like Jos. Cuypers and his son Pierre and Jan Stuyt. Bellot's assistent H.C. van de Leur continued to design in this style for several more years after Bellot had left the country. Shown here is the chapel Bellot designed for a monastery in Eindhoven (NB). 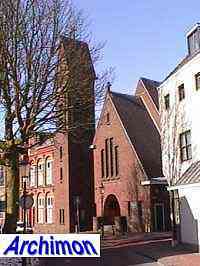 The 'Nederlands Hervormde Kerk' ('Netherlands Reformed Church') posessed most of the medieval churches in the country and had new churches built in those areas with a catholic majority in the first half of the 19th century. After that it did not need to build many new churches until ca. the 1920's, when cities expanded with new neighbourhoods. 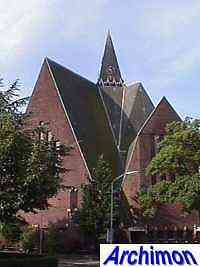 These new churches are often in a moderate sort of expressionism, like this example, the Bethlehemkerk in The Hague (ZH). Incidentally other denominations built new churches in expressionistic style. This Old-Catholic church in Amersfoort, Utrecht is in a moderate expressionistic style. 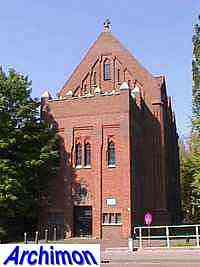 There are also several (former) synagogues that show strong expressionistic influences.